The weather reflects short-term conditions of the atmosphere while climate is the average daily weather for an extended period of time. Both weather and climate depend on Earth’s variables like latitude, pressure, temperature, conditions of land and water. Many of the industries are depending on weather and climate. Weather can turn as a decisive factor in many industries like Trading, Manufacturing, Event Management, Construction etc. For example, in the manufacturing industry, climate change will have an impact on both industrial raw material supplies and processes. Also, climate change can produce new challenges within a construction company, especially when changing weather conditions demand the implementation of new type construction materials and plans. In short, many of the industries as discussed above, need to plan and work accordingly to the weather conditions and weather forecasting for better productivity. Taking into consideration the above climate factors upon industries and their processes, Open ERP /Odoo has come up with a solution to tackle the challenges set by nature. We very know the potentialities of Odoo, right from its inception. There is no doubt that Odoo is complete ERP which is robust at the same time flexible, in managing every type of industries in its utmost efficient and effective manner. Odoo takes care of complete business needs right from their planning to future processing till desired outcomes. 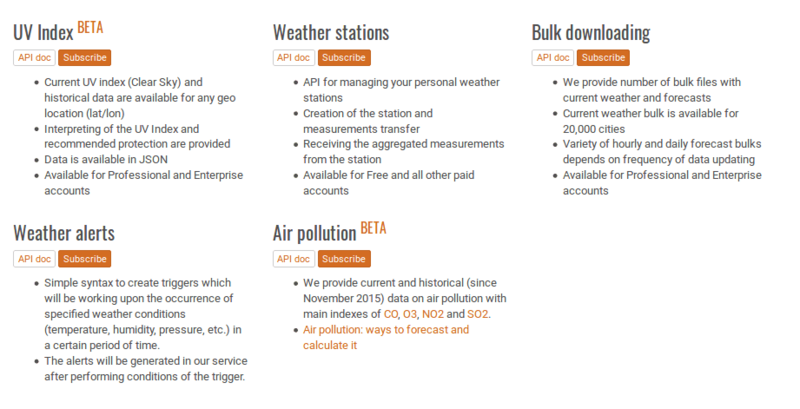 So how can we integrate Odoo ERP with the weather? All you need is a weather forecasting addon for handling the ERP process within weather conditions. 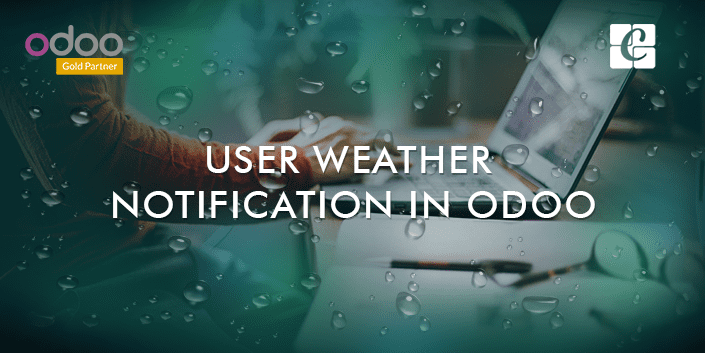 If you believe weather has a direct notable impact on the industrial processes, and a weather module like that of in an Odoo ERP can bring in solutions to the challenges, This blog helps you to understand the potentialities of Odoo in bringing the advanced features of weather forecasting. 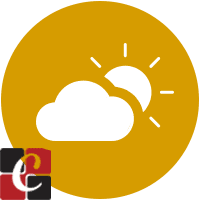 This piece of information gives you a complete list of how a weather module can be used in various industries to understand and plan their works according to the weather condition. This module gives the basic user, the weather notification upon a single click. Also, the user can configure the address of place or Geolocalization for weather notification. There are many API providers for weather forecasting and weather reports, In this addon, I use Open Weather Map and its API key. After installing this module, one shouldn’t forget to install the “pytemperature” python packages. In Ubuntu server use the following command to install this package. After configuration, we can see the weather notification as below. Before configuration, it looks like the below image. 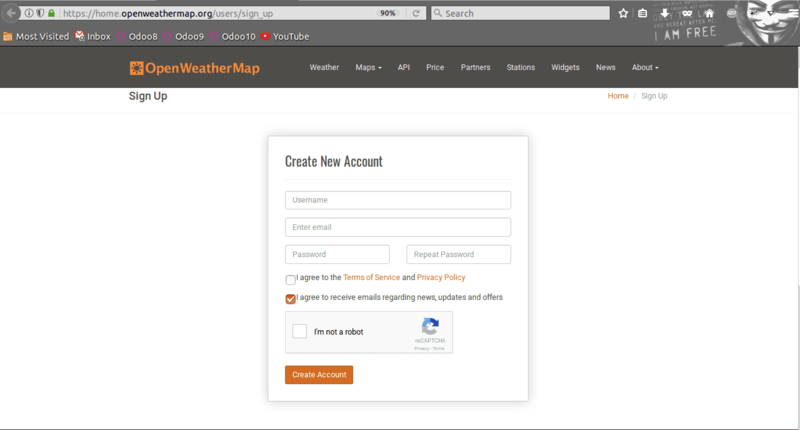 It will redirect you to the account creation page of Open Weather Map. 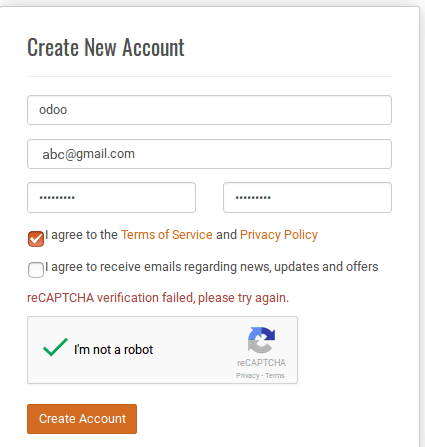 Firstly, one should fill the data and thereby create an account. 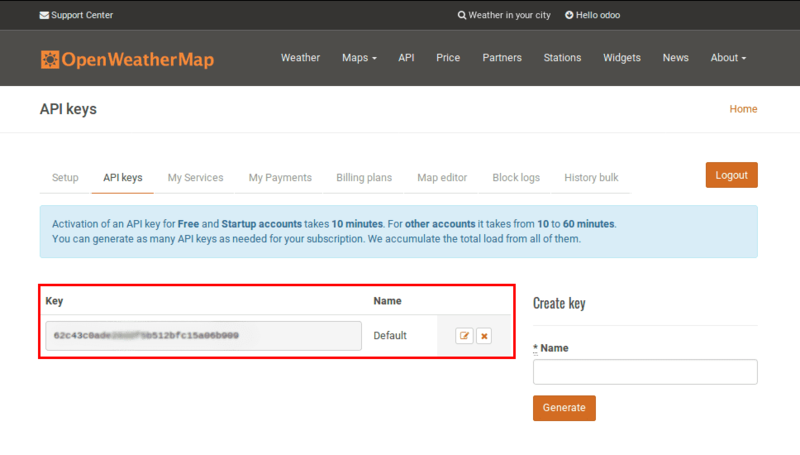 Once the account gets created, we can use the default API key, provided by Open Weather Map or else you have an option for generating your own API key manually. After generating the API key, it comebacks with the same wizard and therefore click the next button to configure the weather data. If you are selecting the address type, please provide the address and if you are providing the coordinates, give the correct longitude and latitude. 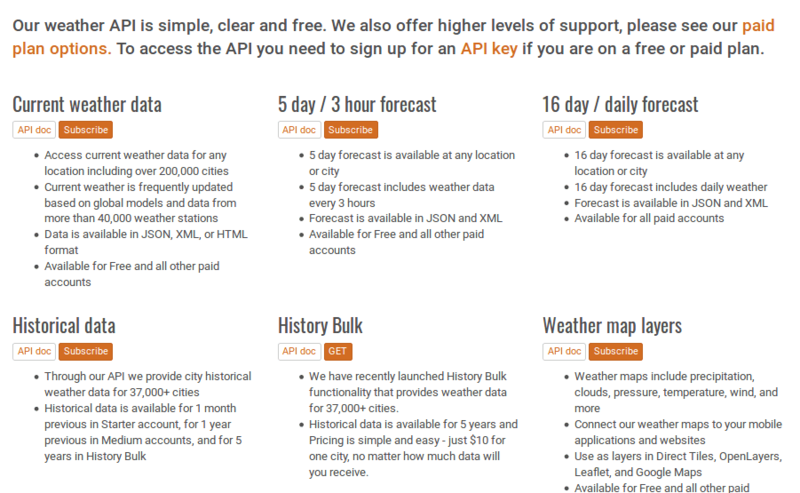 Provide the correct API key received from the OpenWeatherMap site. After the configuration, we can get the correct weather notifications.